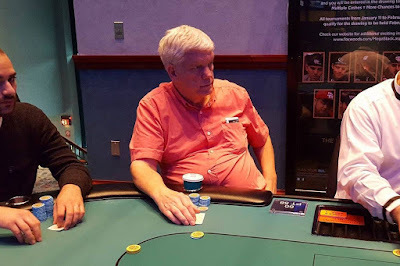 Kevin Kernan raises to 20,000 on the button, and George Alberto shoves all in from the small blind. Kernan calls. The flop comes A♠6♠6♥ giving Alberto the lead with a pair of aces. "Ah man, just give him a queen," Alberto says genuinely. But the 4♣ turn and 10♠ river do not improve Kernan's hand and he is eliminated in 13th place.